I welcome custom and commissioned work. 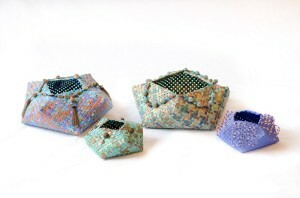 Some clients commission jewelry, woven baskets, and sculptures for themselves or their home. And others like to give them as special one-of-a-kind gifts to their spouses, family, friends, business associates, or for the workplace. 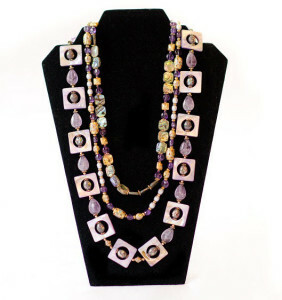 I design a necklace, bracelet, or a set to fit the client’s preferences. The lengths, colors, shapes, components, and scale of each piece will be specific to each individual and their proportions. I’m happy to offer my perspectives and experience with what might be more flattering and accommodating to the individual and their lifestyles. Some clients have a specific outfit or outfits they would like the jewelry to go with. 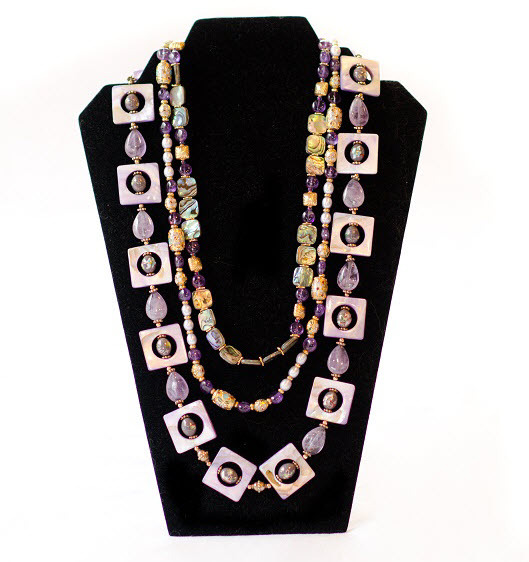 I like to create multiple-strand pieces that can be mixed and matched together and separately. This offers more flexibility and options, giving clients more jewelry for their money. Sometimes clients have components they would like me to incorporate into a new piece. 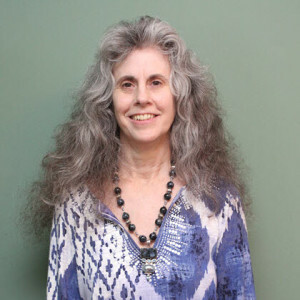 I have a broad spectrum of components, colors, shapes, textures, for a client to choose from: semi-precious gemstones, pearls, wood, horn, shells, glass, cloisonné, ceramic, African and Native American beads, vermeil, sterling silver, copper, brass, vintage and man-made components, pendants, and findings from all around the world. In the initial appointment we get together at my studio to select key components and decide on the lengths and scale of the pieces before I begin work on it. After I compose the pieces, there’s a second visit to try them on before I finish the pieces. Once a client is happy with the work, I’ll finish them and the pieces are then ready to be purchased and taken with them. Most clients have specific colors and sizes they are interested in, to compliment the interior design color schemes in their home or business. One of the unique aspects of my fiber art work is that I often embellish the baskets and sculptures with my own jewelry components or use vintage/contemporary jewelry. I also use feathers, shells, pearls, pine needles, fabric, and other natural components. I don’t always know how I will embellish until I finished weaving the piece. And sometimes the piece may be designed with an embellishment in mind. I have a selection of dyed and natural reed for a client to choose from. 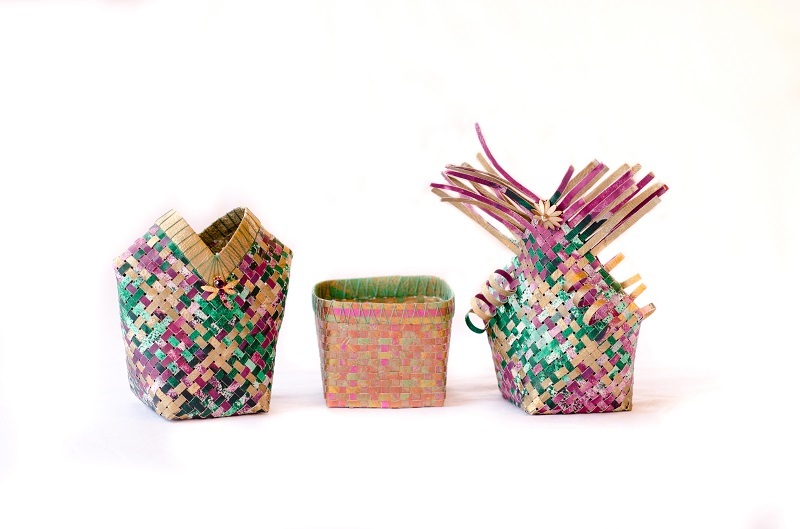 Baskets and woven sculptures can be made using a variety of weave patterns, styles, shapes, and sizes. I also make hand painted and woven baskets and sculptures using archival paper and acrylic paints. This gives me a lot of flexibility and range of colors to work with. For these pieces, I use a pasta machine to cut the paper into 1/4 inch weavers. Once they are woven, I embellish the pieces using my jewelry components or vintage and contemporary jewelry; some of the jewelry can even be removed and worn and then put back on the art.